dearly loved mist: Are Leaves Really Necessary? 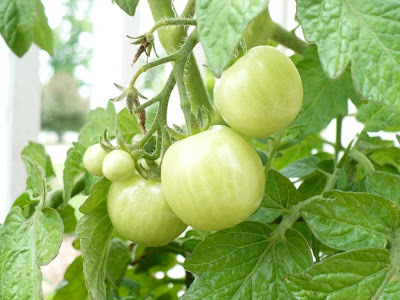 Newly married and wanting to experience the thrills of growing my own produce, but also wanting to start small, I bought one robust tomato plant, tore up some grass in a sunny part of the yard, and planted it. I faithfully watered and fussed over it daily. Just to make sure I was doing things in the proper fashion, I called my mom to ask some advice. She said I was doing everything correctly, but I may want to remove the leaves because that will help the nutrients get to the tomatoes instead of just going to the leaves. Now, she didn't exactly say that, but that is what I heard. Determined to grow the best tomato plant ever, I marched right out and began removing the nutrient-sucking leaves. Soon my tomato plant looked like a twig, with only one or two leaves left on for good measure. Needless to say, I didn't get many tomatoes that year.